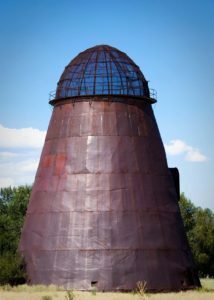 Wigwam burner in Halfway, Oregon. “Have you noticed that every section of the country finds something to brag about?” my alter ego Arnie asked. He was gesturing out the car window at the magnificent stand of pine trees as we scooted along Highway 86 toward Halfway, Oregon. “Yeah, these forests are beautiful,” I said stating the obvious. Arnie wasn’t going to let me get away with that understatement. “Magnificent is what they are . . . magnificent stands of evergreens . . . they are the soul of the Wallowa Mountains,” he said. I set the cruise control and relaxed; Arnie went to sleep. Fairly, soon we were rolling into Halfway where I’d been before. I poked Arnie in the arm. “Coming into Halfway, Arn. Look alert . . . there’s something I want you to see.” I brought the car to a standstill near an open, grass-covered field. I didn’t have to point. Arnie stopped abruptly and held up a hand to quiet me. 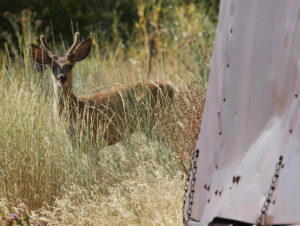 Standing not far from one of the metal sides of the wigwam burner stood a deer. The deer didn’t wait for us to get closer. It sprang into the air, came down and sprinted into the nearby brush. A few steps later we stood at a head-high opening in the side of the wigwam. Inside, three more deer rested on the dirt floor surrounding a pile of ashes left from the days when the wigwam did its work. They quickly bolted away through one of the openings in the wall. 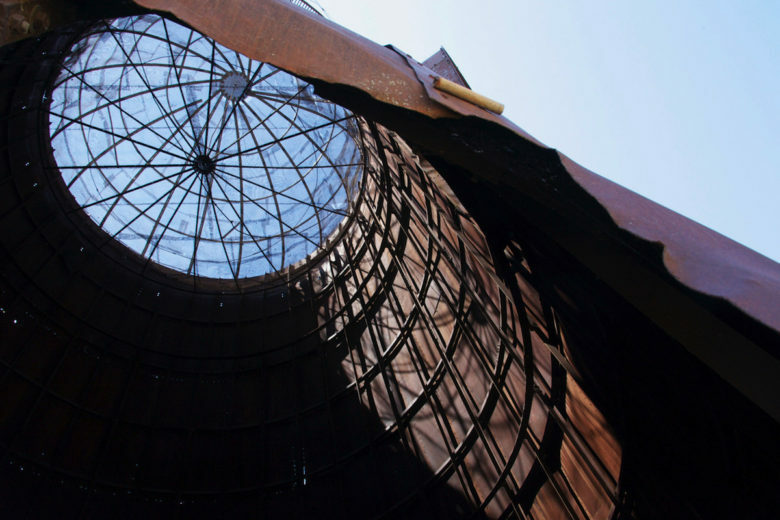 I looked up at the network of steel trusses supporting iron sheets riveted together to form the walls of the burner. An Archimedes corkscrew conveyer system continually fed sawmill waste from the outside into the fire. 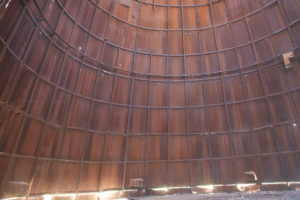 At the top was a screened opening through which smoke exhaust from the burning waste rose into the open air. The double mesh served to prevent hot embers from setting nearby structures or trees on fire. It was an ingenious piece of engineering. Openings, like the one through which we were looking, fed the steady current of air needed to keep debris burning in the center of the cathedral-like structure. Like a blacksmith’s forge, the heat from that fire had to be intense. Some wigwams had kiln bricks next to the iron walls to protect them and the workers who might have to work outside close to it. “I’d say so,” I said, squeezing my way through an opening into the old cold furnace of yesteryear. Arnie followed. We both marveled at the size if the wigwam, enjoying the cool cathedral-like atmosphere. The sun streaming through the opening at the top lit the rusty sides of the furnace giving a brownish red patina to the walls. I capture the scene with my trusty camera. We exited the relic and headed back to our car. Arnie hopped into the passenger seat . . . I slid back into the driver’s saddle. For a few minutes we sat looking at the wigwam. “Long live the wigwam,” Arnie said lifting his imaginary chalice. Arnie makes me laugh. I lifted my glass too. 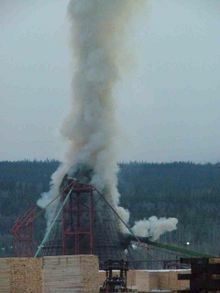 My Dad worked for Van Fleet Lumber in Rainier, Or in the early 1940s and the conveyer belt that dumped the trash wood into the fire from the top of the thimble got plugged up. Dad shut down the conveyer and climbed up to the top to unplug it and his boss came by and noticed that it was shut down. The boss man turned the power back on and Dad did the dance of his life at the top of the conveyer. He was agile enough to keep from being dumped in the fire but I don’t think he ever forgave his boss.